This post is sponsored by Basic Invite – all opinions are my own. 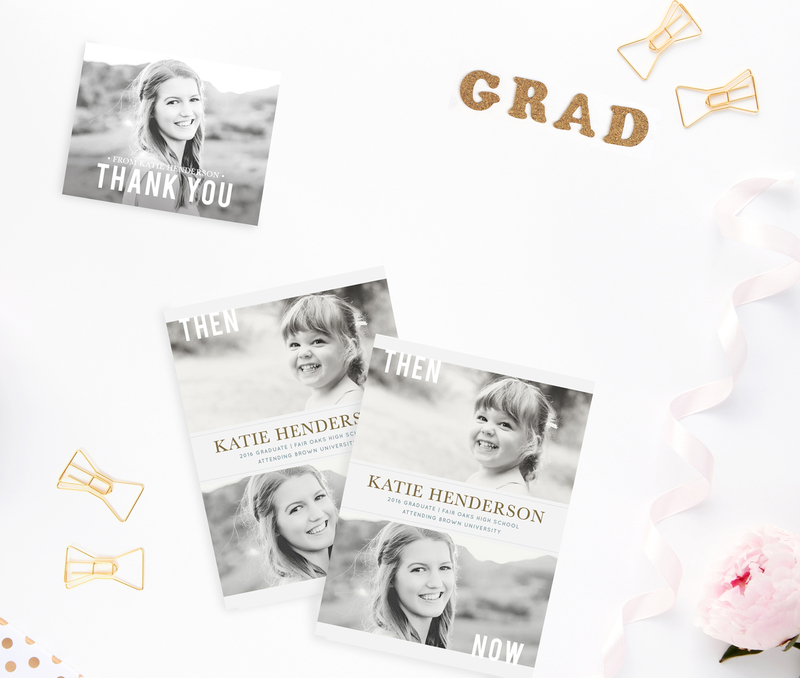 Ever wanted a DIY Graduation Invitations do over? I do. Being the older sister, especially to siblings that are 10+ years younger than me, often gives me an interesting perspective. In a way, the things they do are “old hat” to me. I’ve got my driver’s license. I went to prom (4 times!). I graduated high school. You’d think it would be boring and somehow diminished for them since I’ve done it all already. But in another way, I’m extremely invested in the things my siblings do. I find myself wishing they’d take my advice. I want them to learn from the mistakes I made. To do things better than I did. The same goes for my sister, who happens to be graduating high school this year. As she finishes out the next two months, as she selects a college (with much better grades than I ever earned), as she plans for her graduation party and looks at formal graduation announcements. I want it to be glamorous. I want it to be a huge celebration of all of her hard work. I want her to appreciate it, the way I didn’t when I was her age. 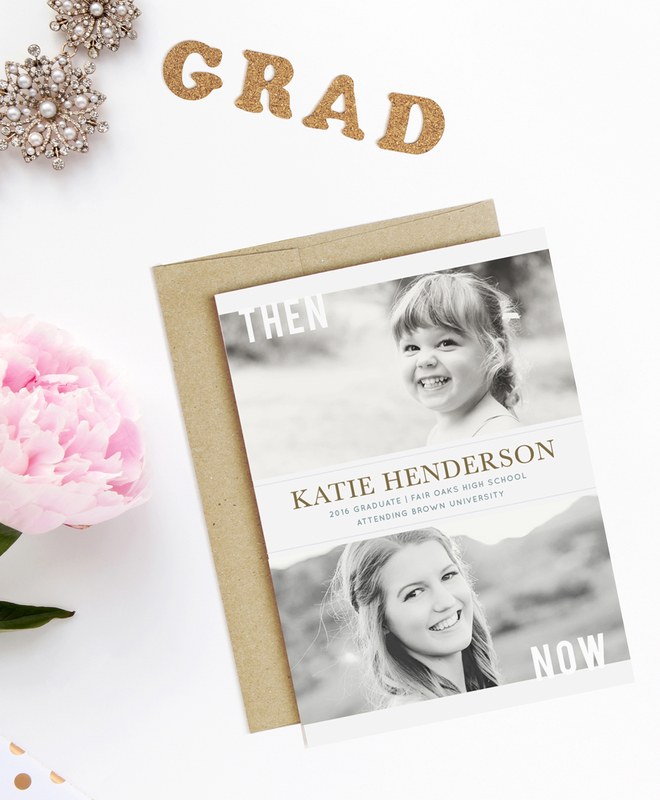 One of the things I can make sure she has, is a gorgeous grad party invitation. Since I’m the graphic designer in the family – I’m the one who gets to do her invitations. I don’t even remember mine, but I’m pretty sure we printed it at home on our inkjet printer. And we tucked my terrible – but professionally photographed- senior photo into the envelope. For my sister, I’m going to design them online. It is generally way easier than staring in Indesign like I do for client work. Online printers usually have some beautiful templates to choose from, which helps save me a lot of time. If I have to start from scratch I usually put it off until the last minute. A great photo of the graduate. I love this one showing a younger picture, and an older one. Make sure you’ve gotten licensing from your photographer to do this. The address of your party hall. People need to know where to go! The school colors, or Grad’s colors of choice. An idea of how many people you are going to be able to visit and feed at the party. Don’t invite 400 knowing you’ll only have food for 40. Some fun facts about the Graduate. Her chosen college, her after school plans, any high school honors she is receiving, etc. 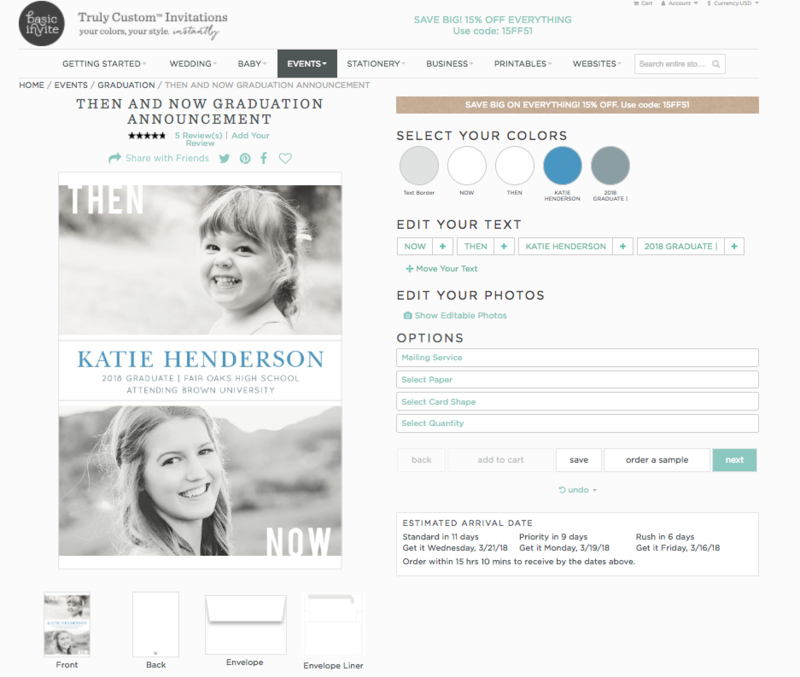 These little details will help make your online graduation card experience a good one. I’ll probably use Basic Invite, for a lot of reasons. (Not the least of which is Right now Basic Invite is offering 15% off with coupon code: 15FF51 ) Firstly – they have a TON of colors. Which means that she can actually get “gold” instead of “yellow”. She’d be the first person in our family to have the actual school colors on her invitation. Also, since I am a paper and color snob, I can order samples and make sure I like them. That is definitely better than guessing based on the color on my monitor. Secondly, they have a cool Address Capturing Service where she can share a link out to Facebook or our Family Closed Group and let people sign up. Then, I can print from those addresses on her invites. That’s HUGE! I had to carry around a notebook for weeks trying to track down my friend’s addresses, and eventually ended up hand delivering a bunch of invites to people’s lockers. 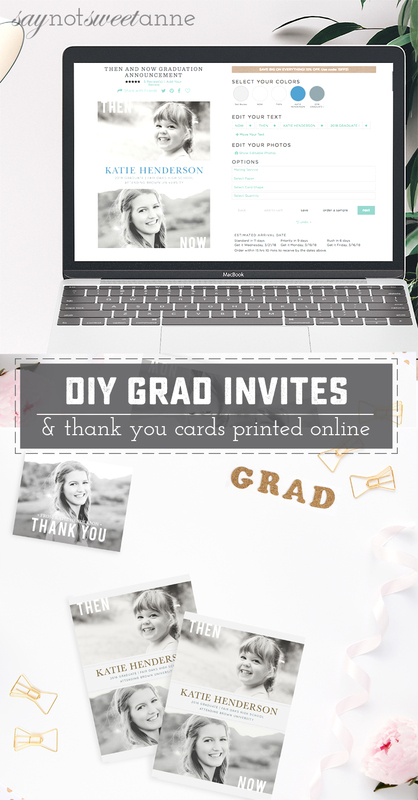 Finally, Basic Invite has grad thank you’s. I can order them at the same time as the invites, and she can fill them all out as she opens her gifts. 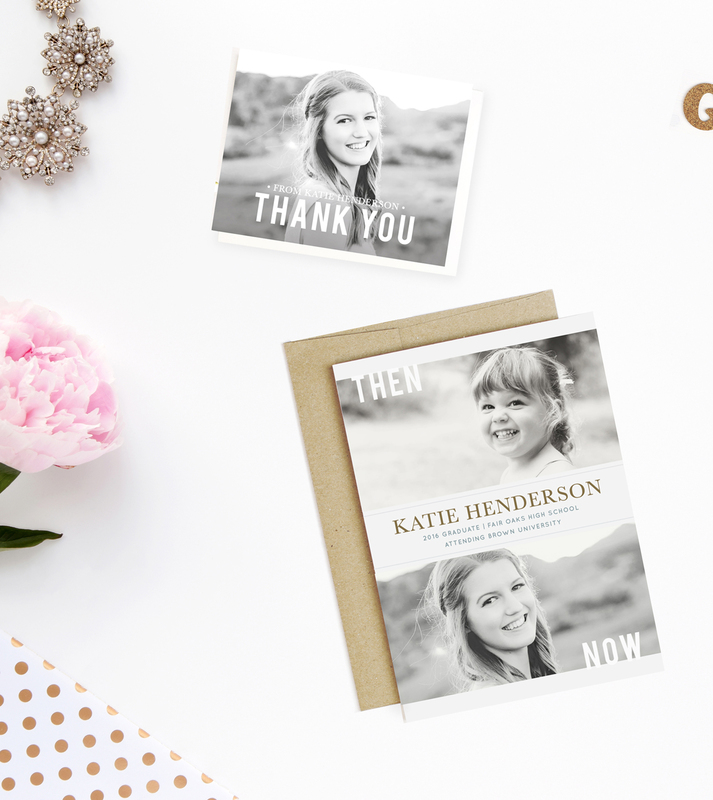 It’ll be one of her first opportunities to send a formal thank you letter, and I think it starts her new adulthood off on a great, thankful note. I can’t wait to help throw my sister the best Graduation party our family has ever seen. I’m proud of her, she deserves it, and I want a do over!